No machine required for this recipe that uses coconut milk. Although I have not made this exact recipe, I have made simple and delicious ice cream by adding fruits, chocolate or nuts and honey to coconut milk and freezing it. A delicious, healthy, no-sugar dessert! I am currently in the midst of some dietary experiments to help improve my energy and digestion. 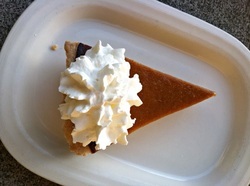 Since I am not eating sugar or dairy, I have been creating simple, food allergy-friendly desserts. This one has only 6 ingredients and can be altered according to what is in your cupboard. It tastes similar to an ice cream shake and is easy, delicious AND healthy! Water or Coconut Milk: unsweetened. Enough to blend and drink (usually about ¼ cup). Alternative: Frozen pineapple and/or mango is great in this as well! Consider omitting the chocolate and the banana. This quick and amazing recipe comes from Better Homes and Gardens (www.bhg.com/recipe/orange-chocolate-chip-muffins/). I make a gluten-free version (changes are below in italics) and they are the best muffins I've tasted in my life! The orange juice and orange zest add a bright flavor dimension to these scrumptious chocolate chip muffins. When you double the chocolate chips, they really seem more like a dessert. Preheat oven to 400 degrees F. Line twelve 2 1/2-inch muffin cups with paper bake cups; set aside. Or just coat muffin tin with coconut oil or butter. In a large bowl stir together flour, baking powder, and salt. Stir in chocolate pieces. Make a well in the center of flour mixture; set aside. In a medium bowl combine eggs, sugar, milk, orange peel, orange juice, and oil. Add egg mixture all at once to flour mixture. Stir just until moistened. Spoon 1/4 cup of the batter into each prepared muffin cup. Prepare Streusel Topping: In a medium bowl stir together flour and sugar. Using a pastry blender, cut in butter until mixture resembles coarse crumbs. Stir in walnuts and chocolate pieces. 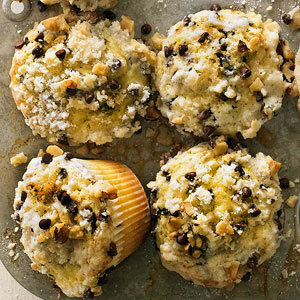 Sprinkle muffin batter in the tins generously with the Streusel Topping. Bake for 18 to 20 minutes (bake only 15 minutes for gluten free) or until a wooden toothpick inserted in centers comes out clean. Cool in muffin cups on a wire rack for 5 minutes. Remove from muffin cups; serve warm. Snickerdoodle Cookies- Vegan and Gluten Free...but you'd never know it. This recipe makes one of the best gluten free cookies I've ever tasted. My friends who are not gluten free also love them! The recipe is adapted slightly from one a friend gave to me a few years ago, which I believe was from Baby Cakes, an excellent resource for baking tasty vegan treats, many of which are also gluten free. The flaxseed not only holds these babies together but also is a source of much needed fiber and anti-inflammatory omega-3 fatty acids. 1. In a medium bowl, whisk together the sugar, flour, flax meal, baking soda, xanthan gum, salt and 1 TBSP cinnamon. Add the oil, applesauce, and vanilla and mix until a thick dough forms that resembles wet sand forms. Cover the bowl with plastic wrap and refrigerate for 1 hour. 2. Make the cinnamon-sugar mix by taking the sugar and cinnamon and mixing them in a shallow bowl together. 3. Take the dough out of the refrigerator and preheat the oven to 350. Form small balls with the dough and roll around in the cinnamon/sugar mix to coat. Place on ungreased baking sheets about 1 inch apart. Gently press each cookie with a fork to help them spread. Bake for 7 minutes, rotate the baking sheets and continue baking for 7 more minutes or until cookies are slightly crispy around the edges. Do not over bake. Let stand on the baking sheets for 15 minutes before serving. Note: you can also freeze the dough once the balls are pressed flat and ready to bake. I just put the discs carefully in a large ziplock bag and freeze until I’d like to bake them, sometimes in smaller batches. Do not thaw before baking, just put the frozen cookies directly on a sheet in a preheated oven. You may need to add a few minutes to bake time. 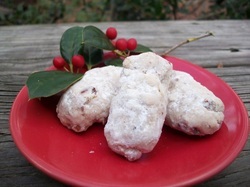 My Grandma Marj’s recipe for my favorite holiday cookie that goes by many names…now easily made gluten and dairy free. The key to baking gluten-free in this recipe is not to over bake! Keep an eye on them while baking. They are meant to be somewhat dry, dense and crumbly but still moist enough from the butter or oil that they melt in your mouth. 2. Cream butter well, add ¼ sugar gradually and continue creaming until light and fluffy. Add flour mixture gradually and mix. While cookies are warm, roll in powdered sugar. Roll a second time in powdered sugar if desired once cool. This is my mother's gluten-free adaptation of a recipe calling for white flour from Pillsbury Kitchen's Family Cookbook. The main difference is the use of gluten-free flour and, contrary to normal gluten-free baking, actually extending the baking time by a few minutes. When I was growing up, she used to make these with white flour and now even my dad likes this gluten-free version even better! Heat oven to 425 F. Heat water and butter to boiling. Stir in flour and salt. Cook on medium, stirring vigorously until mixture leaves sides of pan in smooth compact ball, about 1 minute. Remove from heat. Add eggs, one at a time, beating vigorously by hand after each until mixture is smooth and glossy. Spoon 6 mounds of dough about 3 inches apart onto ungreased cookie sheet. Bake at 425 for around 30 minutes (or 22 minutes if split between 9 balls) or until puffed and golden brown. Cool completely. Split in half and fill with ice cream, pudding or homemade whipped cream (Beat a pint of whipping cream with an electric mixer on high. Then add 2 teaspoons of vanilla extract and 3 Tablespoons of honey and briefly mix again). This is an adaptation of a delicious recipe my aunt Kelly has perfected. Perfect with fresh picked blueberries or any fruit really. It's also great with a combination of strawberries, raspberries, rhubarb, blueberries and apple. I've also made it while backpacking with apples...next I'll try huckleberry cobbler on the trail. It can be made gluten-free, dairy-free or sugar-free if you prefer (see adaptations in recipe). It is quick, easy and very adaptable to whatever ingredients you have. This is a more health-friendly but even tastier version of the carrot cakes I had growing up. It is rich and moist from the carrots and zucchini and has some protein to balance out the carbohydrates. It works well if you have some type of food processor for shredding the veggies and grinding the nuts. 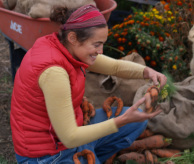 Again, the measurements are estimates so you don't have to weigh the carrots etc. This makes two thin 9 inch round cakes to stack with frosting in between if you'd like. 1 . For the cake: mix all the dry ingredients together first and then add the wet ones. mix well. 3. Bake at 350 for 30-45 minutes. Check frequently so as not to overcook. Check with fork. Cake will be very moist but fork should come out clean. 5. For the frosting: mix all ingredients except powdered sugar with hand mixer. Add the sugar slowly until smooth. 6. Spread on top of first cake layer and stack the second cake layer on top. Frost top and edges to your liking and decorate with shredded coconut, shredded carrots and coarsely chopped hazelnut, walnuts or almonds, whatever you used inside. Refrigerate until close to serving time. This decadent cake is rich and has a wonderful dense texture. Made with either ground hazelnuts or almonds as well as 6 eggs, it contains a significant amount of protein to offset the spike in the body's bloodsugar caused by the sugars in the cake. It is delicious chilled and served with whipping cream or fresh berries. This cake is gluten-free and may also be adapted to be dairy-free by using soy milk instead of cream and coconut oil instead of butter. side with a sheet of baking paper (parchment). I like to trim the edges of the paper as they stick out above the edge of the pan. mixture. Beat to combine. Add hazelnut or almond meal. Beat to combine. one-third of eggwhites into the chocolate mixture from the step above. Then gently fold the remaining eggwhites into the chocolate mixture. 5. Pour cake mixture into prepared pan. Bake for 1 hour or until a toothpick inserted into the center comes out clean. for 3 to 4 minutes or until smooth. Add honey until melted. Remove from heat and add vanilla extract. Mix, then chill for 30 minutes (if you have the time). Pour/spread over top of the cake still in the pan. Stand for 10 minutes or until icing has set. I actually like to finish this cake earlier in the day and let it chill for an hour in the fridge. 7. This cake tastes great by itself or served with whipped cream and/or fresh berries. --Sometimes the coconut oil separates out of the icing slightly. It still tastes great and makes a neat white swirled design in the chocolate. If you'd like to prevent this design, cool the icing completely and stir before spreading on the cake. You may also use butter in place of coconut oil in the icing for a different flavor and to prevent the separation design. --I like to make the whipped cream homemade. Whip a 1/2 cup of heavy whipping cream on high with an electric mixer. Sometimes I add a teaspoon or two of honey to sweeten it a bit.